Palestinian amora of the fourth generation, sometimes cited as Ḥanina of Cæsarea (Cant. R. i. 2). The Talmud relates that his father, R. Abbahu, sent him to the academies at Tiberias to study, but that he devoted himself instead to pious deeds, such as attending the dead. Abbahu thereupon wrote to him, "Is it because there are no graves in Cæsarea that I have sent thee to Tiberias?" (see Abbahu). In the Halakah several precedents of his father's are reported by Ḥanina (Yer. Yeb. iv. 6a; Yer. Ket. iv. 29b; Yer. Ḥal. iii. 62c). 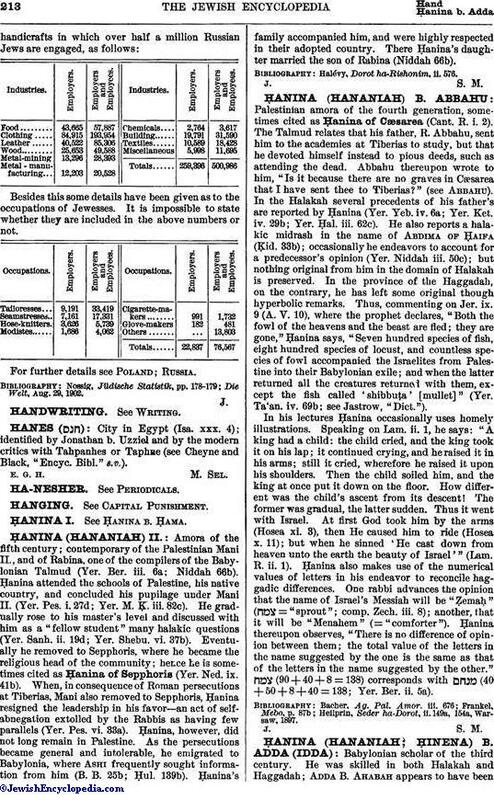 He also reports a halakic midrash in the name of Abdima of Ḥaifa (Ḳid. 33b); occasionally he endeavors to account for a predecessor's opinion (Yer. Niddah iii. 50c); but nothing original from him in the domain of Halakah is preserved. In the province of the Haggadah, on the contrary, he has left some original though hyperbolic remarks. Thus, commenting on Jer. ix. 9 (A. V. 10), where the prophet declares, "Both the fowl of the heavens and the beast are fled; they are gone," Ḥanina says, "Seven hundred species of fish, eight hundred species of locust, and countless species of fowl accompanied the Israelites from Palestine into their Babylonian exile; and when the latter returned all the creatures returned with them, except the fish called 'shibbuṭa' [mullet]" (Yer. Ta'an. iv. 69b; see Jastrow, "Dict."). In his lectures Ḥanina occasionally uses homely illustrations. Speaking on Lam. ii. 1, he says: "A king had a child: the child cried, and the king took it on his lap; it continued crying, and he raised it in his arms; still it cried, wherefore he raised it upon his shoulders. Then the child soiled him, and the king at once put it down on the floor. How different was the child's ascent from its descent! The former was gradual, the latter sudden. Thus it went with Israel. At first God took him by the arms (Hosea xi. 3), then He caused him to ride (Hosea x. 11); but when he sinned 'He cast down from heaven unto the earth the beauty of Israel'" (Lam. R. ii. 1). Ḥanina also makes use of the numerical values of letters in his endeavor to reconcile haggadic differences. One rabbi advances the opinion that the name of Israel's Messiah will be "Ẓemaḥ" ( = "sprout"; comp. Zech. iii. 8); another, that it will be "Menahem" (= "comforter"). Ḥanina thereupon observes, "There is no difference of opinion between them; the total value of the letters in the name suggested by the one is the same as that of the letters in the name suggested by the other." (90 + 40 + 8= 138) corresponds with (40 + 50 + 8 + 40 = 138; Yer. Ber. ii. 5a). Heilprin, Seder ha-Dorot, ii. 149a, 154a, Warsaw, 1897.